Unhealthy State - Anatomy of a Sick Society. by Maev-Ann Wren. New Island, Dublin. 2003. pp 445. A detailed review written on July 29th, 2005. The author’s examination of the health delivery service is detailed, comprehensive and highly critical. It appeared at the same time as several commission reports which had been set up to examine different aspects of the service. The earliest of these recent reports was the Deloitte and Touche report ordered by the Department of Health to examine the value for money of the service. The Hanly (on medical staffing) and Prospectus (to assess functions and structures of the service) reports appeared in 2003 and were commissioned by the same department. The Brennan report (management and control of spending) was commissioned by the Department of Finance. 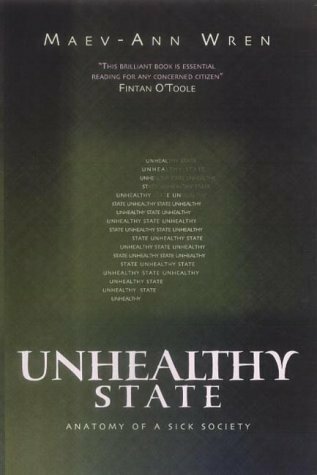 Unhealthy State is based on extensive research into all aspects of private and public health and will undoubtedly provoke a reaction which will bring about at least some change. Ms Wren is particularly critical of the lack of equity in the service with poor access to primary care for the less privileged members of the community. And many of the existing problems within the service she attributes to under funding of health by successive governments. She is also critical of the specialists in the hospital services because of their method of payment, their high average income in the public service and the high income of some who are in private practice. She is critical of the current mix of public and private medicine and of the fees charged by general practitioners. She underlines the fact that the Irish health service has evolved over the years in a piecemeal and haphazard fashion because of poor long-term central policy and strategy, and failure to face up to abuses which she attributes to the medical profession, local politicians and other dissident groups. She is particularly critical of the current Fianna Fail administrations. The recent reports which have been issued on health affairs, widely quoted in her pages, and her detailed analysis, have lead to widespread comment in the popular and medical press. The media comments have been critical of the government and the medical profession, while the medical press has been invariably defensive of the profession. Close to 50% of the Republic’s population is covered by health insurance, of whom more than 80% are with the VHI. The head of the VHI, Vincent Sheridan, is currently pressing the government to privatise the company because he believes that there are compelling financial and economic reasons why the health insurance industry should be more competitive and in a position to make decisions free from government interference. I spoke to Mr. Sheridan about his proposals but his reasoning was a little beyond my understanding. I gave him a copy of our IMA 1974 report on compulsory health insurance as a possible health delivery system for Ireland but he had no strong views about this proposal one way or another. Sheridan reminded me that, in speaking to Tom O’Higgins shortly before his death; O’Higgins told him that the VHI scheme which he launched as Minister of Health in 1956 was modelled on the Australian system of health insurance, a fact which I was unaware of. We spoke about such problems as conflict of interest, lack of audit and unusually high incomes from private practice which clearly impinge on both the private and public services, but, even if the insurance authorities are aware of such anomalies, they obviously do not feel that they have any function in interfering with professional matters. I also referred to the lack of evidence based practice but again this is entirely a matter for the profession itself to attend to. A real problem must be that it is the hospital doctors who determine the resources which are needed but doctors have little interest in or knowledge of cost efficacy, and so far it has been very much a consultant, and possibly doctor, driven service. What are the basic elements of an ideal health delivery service which would exist within the many current political, financial, professional, social, and cultural restraints? That such a system has not been devised in Western countries is clearly apparent, almost certainly because of the rapid advances in medical care and technology since the mid-twentieth century, because of an increasingly assertive, demanding, litigious and educated public, the gradual erosion of the extended family, and to some extent at least, the partial erosion of the vocational aspects of the profession by an increasing commitment to accumulating wealth, a trend which the profession shares with the rest of the community. The ideal system must include immediate access to primary and specialist care for the entire community; efficient central direction and efficient administration at local level; well trained health professionals; emphasis on cost efficiency as well as high professional standards through audit and peer review; and financial investment commensurate with other demands on the public and private purses. It might well be asked if it is possible to provide a service which would satisfy everybody, bearing in mind the increasing cost of medical technology and the prospect of a more demanding and ageing society, where the old are subjected to expensive ‘salvage’ medicine, Ivan Illich’s prolonging of death, which will raise increasingly serious ethical as well as financial questions. The VHI and BUPA premiums have increased at an average of 10% over the last five years. With the escalating costs of medical care it would be wise to assume that these increases, at three times the rise in the cost of living index, are likely to continue. Certainly any pretensions of achieving a more equitable and efficient service will require government to move from a low tax to an high tax economy, and may lead to the need to contribute 20% or more of GDP to health care by 2010. The estimate of 12% by 2022 by the United Kingdom Treasury is likely to be very wide of the mark. It will also require a new sense of idealism on the part of the electorate if we are to achieve a more just and stable society. In commenting on Ms Wren’s book, I would like to deal with the following subjects raised by her - the question of equity, the public/private mix, the role of the medical profession, the role of the nursing profession, the role of government and health promotion. Inequalities in access to optimum services are perhaps the most glaring shortcoming in the current health service. It exists at both primary general practitioner as well as at hospital level. To achieve equity would require drastic changes and more assertive authority by government. Equity at a primary level could be more closely achieved by increasing the number of medical cards to a higher threshold of income and by including other non-eligible people who may be disadvantaged for one reason or another. Or might the middle 20% or so of those who experience hardship when attending GPs and who have difficulties in paying for medications not be partially assisted by a state scheme? There are serious inequities in the hospital services where public patients are subjected to unacceptably long waiting lists for specialist consultations and treatment in hospital, and are subjected to other disadvantages, including less certain contact with consultants, more dependence on doctors in training in their management and treatment, and the cancelling of appointments and services, including operations, because of shortage of beds, shortage of staff and other shortcomings. Shortage of beds is considered to be the major factor in creating the long waiting list as is shortage of staff. It is possible that staff shortages might be solved by providing more money and by increasing the payment of health staff, but perhaps more efficient use of beds might be more effective and less costly. A large number of beds are currently occupied by patients in our hospitals who cannot be discharged because of the deficiencies in suitable domestic and institutional accommodation for the old, the permanently disabled and those in unsuitable domestic circumstances. Perhaps we should give priority to the provision of much better facilities in this area, and such a priority would anticipate the inevitable increase in the proportion of older people during future decades. Bed usage is also reduced by failure to extend the elective hospital services beyond the restrictions imposed by the concept of limiting hours of work to the eight hour, five day week. The increasing use of day care or overnight care should be strongly encouraged as well. I suspect that a policy simply devoted to increasing the number of beds without tackling the problem of inappropriate in-patients, the reduction of the average stay of patients, discouraging the admission of patients simply for tests, and extending the hours of elective work, would have little effect on waiting lists. Higher staff levels, particularly of nurses and consultants, and a careful analysis of the nature of the waiting lists are mandatory. For instance, I believe the waiting list for heart surgery is long because many of those who are awaiting by-pass surgery are best to continue treatment by medical means, particularly in the light of major recent advances in medical treatment in patients with angina and those who have recovered from a heart attack. Uncertainties in this area can be attributed to the lack of proper trials which would provide evidence based guidance about appropriate treatment. Heart surgery may seem more attractive to the patient and the doctor because it provides more compelling abreaction than the less dramatic medical treatment based on patience, counselling and patient co-operation. The contemporary cardiologist is deeply committed to invasive investigations and treatment but the disadvantages of invasive treatments, such as coronary surgery and angioplasty, and the efficacy of a conservative approach are not sufficiently realised. There are also problems within the private system of medical practice. There is compelling evidence that private patients, at least outside those admitted to public hospitals, are subjected to many more investigations, including the more elaborate ones, and more intensive and prolonged treatment than public patients, a belief which is consistent with the necessity for private hospitals to adequately use the expensive diagnostic facilities which they provide. The contention that private patients are subjected to over-diagnosis and over-treatment is supported by Ms. Wren’s evidence that private patients are three times more likely to have a coronary angiogram than public patients. Whether this means under investigation of public patients or over investigation of private patients is a moot point. I would consider the latter to be more likely. There is a compelling reason for more audit and accountability by doctors and medical institutions, both in the private and public arenas. In the context of the increasing cost and complexity of medical practice, it is unlikely that we can achieve much needed improvements in our health services without effective audit of all aspects of the system. There are obvious problems of conflict of interest for doctors, particularly in the private system. They are in the areas of ownership of profit making private hospitals and clinics, and of invitations to doctors to invest in new pharmaceutical companies. There are also elements of conflict of interest in certain areas where specialists benefit financially by ordering tests which they perform themselves. There was an old ordinance in the rules of the Royal College of Physicians that no fellow of the college could have a financial interest in a chemist’s shop. I do not know if this rule has lapsed nor do I know if the various royal colleges have a current view on such problems of conflict of interest. One would expect that the Medical Council would have strong views on this subject but, despite writing twice to the ethical committee of the Council enquiring about their attitude to this recent development in the profession, I simply had my attention drawn to the rules and regulations of the Council, and the question of having shares in a profit making private hospital was studiously avoided. Like many other countries, Ireland has seen a dramatic increase in consumerism and in the materialistic and acquisitive aspirations of all levels of the population, a trend which parallels an increasingly secular and corrupt society, and which contains the basis of the current threat to the planet and to future generations. There is no reason to believe that we are thus a happier, more stable or rational society than we were in past days of relative austerity and of greater limits on individual irresponsibility. It has been shown that the acquisition of goods we want but do not need does not contribute to a more contented society and that too much choice can have a detrimental effect on our happiness and sense of satisfaction. The private and public mix. There appears to be no inherent objection to the retention of private medical practice as long as inequalities are eliminated from our health service. However, assuming a satisfactory service to public patients, it is unlikely that a significant proportion of the population would pay for private medicine, apart from contributing for private accommodation. The current personal contact maintained between doctor and patient (and certainly desired by both) in the private system is an important component of professional practice and this professional need might be best maintained by a universal and compulsory insurance system of service if we were to satisfy the matter of equity. This would be close to the Canadian and the French systems. It is difficult to believe that the current situation of public/private mix in the public hospitals could be developed further without the virtual elimination of private profit or non-private hospitals, although such hospitals seem to survive even under the most socialised systems. Ms Wren, Brennan and Hanly refer to the hospital consultants’ common contract. They maintain that its design and generosity is unique in Western countries. Any fair minded person, including some of the consultants, will agree that a review is required to identify changes which need to be made in the contract to bring the method of employment of consultants more into line with normal circumstances. This need not include the exclusion of private practice among consultants who desire to continue in the area. The profession needs to grasp the nettle of the common contract which we can hardly expect to continue in its current form. Increasing the number of consultants and reducing the number of residents seems an obvious step, while consultants who practise in private hospitals off site should not expect the same income for their more limited commitment to the pubic service. Also, the cost of clinical research should not be a charge on the public service, whatever about the cost of teaching. It would also appear reasonable to cap the private income of all consultants who are in the public service, particularly those who initiate, perform and profit by the more elaborate investigations. According to Ms Wren, consultants can earn more than E500,000 annually. I would estimate that they are the relatively few who perform invasive investigations. Capping would, I believe, benefit the consultants, relieving the frenetic and over-worked conditions which many of those who attend private hospitals outside the public hospital campus seem to be prone to. The number of private patients in the public hospitals frequently exceeds the 20% allowed under the common contract. Such patients must be an important source of income, particularly for the consultants in the larger urban areas. It would be desirable to claim a proportion of the private fees derived from this group of private patients for research, and for professional and academic purposes for the health professionals. I suspect that the income from private patients in public hospitals may not be equally shared by the consultant staff. This point should be clarified. It would seem reasonable that such fees should be equally divided between all members of staff. It is unlikely that real order can be brought into the health services here without some radical changes within the medical profession and this would need to come from within the profession itself. Doctors have traditionally received the support of the Irish people when they are involved in controversy with politicians or other critics. The sympathy of the people is probably a product of the widespread dedication of the profession to charitable work in the past but the charitable role of the doctor is now less evident and it is likely that our profession will not retain the affection and the sympathy of our patients in the future when we are struggling with our adversaries. Consultants in our larger hospitals are not organised in a hierarchical way so that there is less accountability and virtually no audit or attention to cost control. Many years ago I proposed to our newly appointed professors of medicine and surgery at St. Vincent’s Hospital that we should adopt a hierarchical system along the lines of the Cogwheel Report. Each department would have a rotating head who ex-officio would be a member of the medical committee. The chairman of the committee would be elected by the consultants and would be appointed for a limited tenure, say, for five to seven years, rather along the mastership system in our maternity hospitals. He would be required to work closely with the administration and would receive sessional payments for his services. He would be ex-officio a member of the board of the hospital and would be responsible to the board for the standards maintained by his colleagues. Through the medical committee he would have certain executive powers to deal with medical staff problems. The changing financial and academic status of the nurses in recent years has added significantly to the financial and organisational problems of the hospitals. The move from the hospital to the university campus during the years of nurse training has deprived the hospital of valuable nursing input and has deprived the nurse at a sensitive time in his or her career of the vocational stimulus which is essential in a caring profession and which is derived from direct hands-on patient care. Equally important has been the adverse effect on the ethos of our hospitals because of the loss of our on-site training schools, and the inevitable reduction of the strong links which existed between the nursing staff and its alma mater. In my time at St. Vincent’s Hospital our nursing school, first established in 1892, was highly regarded both nationally and internationally, and was an integral part of the hospital’s proud history. It vanished overnight two years ago, as did the founders of the hospital, the Sisters of Charity, and with them went the spirit and the pride which was the source of our loyalty to a great institution. In Ireland we are facing an increasing shortage of nurses, a shortage which is being filled by foreign nurses who are being induced to come here although their country’s situation may be at least as bad as ours. Is the fall in recruits for nursing among the young in Ireland caused by economic, social or cultural factors or is it related to a decline in the attributes of caring and compassion which is nowadays evident in many walks of life and which appeared to motivate people more in former times? I believe the major cause of the current decline in the numbers of Irish nurses in our hospitals can be attributed to the loss of our hospital schools and the training of young nurses for their first three or four years on the university campus. While the number of applicants for nursing remains at a satisfactory level, there is now a huge drop-out among undergraduates and postgraduates, a phenomenon which was not a problem in the days of the hospital school. It would be worth enquiring if the same shortage pertained in other western countries at the time they adopted the university training system. I cannot believe that the candidate for nursing who spends the first three or four years on the campus of University College, Dublin, or any other Irish university, is likely to retain the full flush of enthusiasm and compassion for the sick which are often behind the choice of nursing in the first place. Poor financial rewards and irregular hours are often cited as problems in attracting people to the nursing profession, but I would question these assumptions. In earlier years, these considerations appeared to have little influence on a profession which was traditionally dedicated to patient care, and nowadays the conditions of nursing have been greatly improved. Unfortunately, increasing material expectations will always create financial difficulties for those on a fixed salary and with an effective organisation which can hold society to ransom. On page 84 Ms Wren states ‘the political system is one of the barriers to reform, if not the major one’. The government and politicians’ roles are dealt with in great detail by the author. It is clear that, from the end of world war one, successive Irish governments have failed to establish a coherent and rational policy in relation to the health services. The failure of government is perhaps understandable, bearing in mind the failure to predict the rapid advances in medical care and technology, the rampant cost of such advances, and the increasing expectations of a better educated and litigious public. Nevertheless, most other western countries have shown better vision in adapting to the social and health changes over the past 50 years. 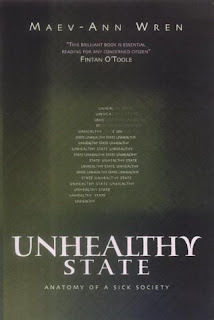 It is reasonable to claim that the Irish system has evolved in a piecemeal manner with little coordinated central planning and with government’s failure to impose its policies because of dissenting and minority groups, mainly local politicians, the medical profession and medical industry. One might attribute government failures to conceive and impose well planned policies on our particular brand of the party system where there is an increasing trend by government to put party and electoral considerations before its responsibilities to the community. Ms. Wren refers repeatedly to the government’s supine response to the minority groups who successfully resist efforts to bring about necessary changes in the health delivery service. She reminds us how ineffective has been the Department of Health over the years since it was established in 1946. Both Lloyd George and Winston Churchill, in their separate musings about democracy, universal suffrage and the parliamentary system, had reservations about the party system. Lloyd George wrote about the evils of the party system and looked with disfavour on party control. We can certainly share the same view about the current situation in Ireland. Every aspect of public life, every branch of administration, including health, education, transport and local government, to mention a few, has suffered because of the failure of our democratically elected leaders to put the public good before their determination to remain in power. Surely the Platonic concept of democratic leadership, based on detachment from personal gain and on personal integrity, which we enjoyed in Ireland in the 1920s and 1930s, is a thing of the past and can only be retrieved by radical changes in public ethics and in the electoral system which prevails in Ireland. Desirable changes might be achieved by the elimination of the rigid whip system in parliament (except perhaps for a limited number of finance bills); by single seat constituencies with the transferable vote to allow our TDs to devote their time, energies and skills to central affairs, and not be constantly looking over their shoulders to constituency affairs and electoral rivals from the same party who may be beavering away locally; by reducing the number of TDs and paying them better (and at least as well as high court judges and hospital consultants); and by confirming recent dual mandate legislation which prevents TDs from membership of local councils and committees where political privilege might be abused. Where central government has been most at fault is its failure to provide for the increasing need of the old, the lonely and the disabled. It is estimated that up to 20% of the patients who are lodged in the main hospitals in Dublin are there because they are awaiting discharge to more suitable institutions or to their homes where no assistance may be available to care for them. And not a few are in hospital awaiting transport or the support of relatives. It must be clear if we had more efficient means of discharging patients, it would make a significant difference to our exceptionally long waiting lists, the main reason for the inequalities in our health delivery system. Winston Churchill, writing before 1932, was less than enthusiastic about the political system in the United Kingdom at the time, believing that it no longer attracted the ablest people in government. If we are to attract the ablest and most trustworthy ministers in Ireland, we should adopt a more satisfactory party and electoral system. At various points, Wren refers to the neglect of health promotion and the need for more emphasis on health education. It is hardly necessary to note the very poor constituency preventive medicine has within the profession and among our politicians. The anodyne of health promotion is received by the great majority of my colleagues and our politicians with the glazed look, and, anyhow, if we were to become an active health promoting population, it is unlikely to reduce the cost of the health service because of the huge cost of caring for the aged sick and infirm. But undoubtedly there are huge opportunities for improving the health of the middle aged and younger old population. Only when all citizens can access adequately resourced primary care and when hospitals treat the most ill first can Irish life expectancy and health be expected to improve significantly relative to other EU states. She disagrees with the Fianna Fail TD and Minister of State at the Department of Health in 1999, Frank Fahy, who was concerned about healthy life styles within the service, while she appears to approve of the Chief Medical Officer in the Department of Health, Dr Jim Kiely, when he said that health ‘was related ----- to the problem of inequitable access to health services based on need’. Good medical facilities may play a small part in improving life expectancy but the life style of the population is much more important as is apparent when we correlate the proportion of GDP devoted to health in various western countries with life expectancy. There is no such correlation, positive or negative. Countries such as Greece, with one of the lowest investment in terms of proportion of GDP devoted to health, has a better life expectancy than the wealthy United States which has the highest. The countries in southern Europe have at least as good a life expectancy as the heavier spending and wealthier northern European countries. And the health of a nation is not entirely divorced from the wider consideration of an increasingly secular, violent, corrupt and less compassionate society in a culture of excess. It is interesting if somewhat irrelevant to my subject that the same lack of correlation exists in western countries in relation to education. The wealthiest countries are not necessarily the best educated, at least at primary and secondary levels, almost certainly because their heavier spending on education goes to high technology investment and not to the more important encouragement of the teacher/pupil relationship. The education authorities need to know more about the tradition of teaching which existed in this country by dedicated religious and lay teachers in the past, with nothing, neither computers nor inside loos, but close contact between teacher and pupil, a system which lead to the emerging of a disadvantaged Catholic population ready and able to undertake self-government. We need fewer computers and less grandiose buildings but a more dedicated and hands-on teaching profession as well as more caring parents. I am sure the first important step is that health administration should be removed from the milieu of party politics. This can only be achieved by transferring the main responsibility for affairs of health from the Department of Health to an authority constituted along the same lines as our semi-State or semi-autonomous bodies, such as the electricity, turf and transport concerns. --------. I believe this change would enormously simplify administration in the future whilst providing a continuity of policy in health legislation which is badly needed and which would be appreciated by all people interested in social welfare. This Council (that is, the independent health body - RM) should be established with strong and comprehensive executive powers over all health services in the country requiring the assistance of public money. It should also bear the responsibility for the direction of new health policy. It should be answerable to the Government on matters of finance -----. My contention was that the health service in 1959 was weighed down with anomalies and inefficiencies, that it lacked a coordinated focus, that its shortcomings were aggravated by political Influences at central and local levels, that the Department and local health authorities shared much of the blame, and that the views of the medical profession were ignored in relation to policy and performance. My one hopeful comment referred to the success of the Voluntary Health Insurance which had been established three years earlier. At a later date, in 1974, I was to chair the IMA working party which recommended the adoption of a one tier nation-wide compulsory health insurance system, copies of which are available.